I’m titling this a race report, because, my gosh, running for office was one of the toughest races I have ever run, even if wasn’t literal running! Most of my weekend recaps have already recapped what the race itself was like, but I wanted to take some time to blog about Election Day, which was truly special. The night before, my friend Chris was texting me that she couldn’t believe Election Day was already here. She was almost more excited than I was, while I was in disbelief that all the campaigning was finally over! I had a little bit of trouble getting to sleep on Monday night, but woke up raring to go. 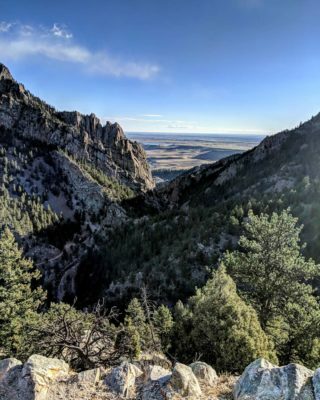 I decided to kick off my Election Day with a solo trail run up Eldorado Canyon to the Continental Divide Overlook. I had been thinking for a while that this would be a great way to start my big day, but I was worried I’d have too many things to do. As a result, I was really excited it was going to work out! 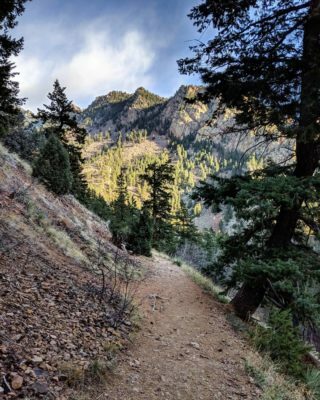 This is one of my absolute favorite trail runs, and I knew it would be pretty quiet on a Tuesday morning so I could have the trails all to myself. I don’t think I’ve run this trail since summer, and I was a little worried I would be totally out of shape on it. It’s 6.5 miles roundtrip (longer than I’ve run in at least a month), has some technical stretches, and also has a lot of climb. On the first steep hill that starts out the trail, I took what I thought were more walk breaks than usual. But once I got to that first mile mark and the trail flattened out, I felt more comfortable running at a good clip. And as expected, I didn’t see a single person on the trail! This was pretty special. How beautiful is this? Such a crisp, perfect day for a run. While I often listen to podcasts on the way up and music on the way down, I spent this whole run listening to my Racing Power Songs playlist, which was exactly the motivational boost I needed to start my day. 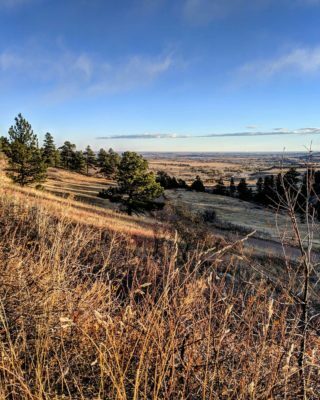 This trail isn’t always the most popular, but this morning I set a record by not seeing a soul until just before I got to the top, when I passed a hiker. I was a little bit bummed to see her, since it meant I wouldn’t have the beautiful overlook all to myself. But it was probably good that I didn’t linger, because I needed to get back for some party prep! I snapped a few pictures at the top, while feeling both literally and metaphorically on top of the world. I was so glad I started my morning this way! 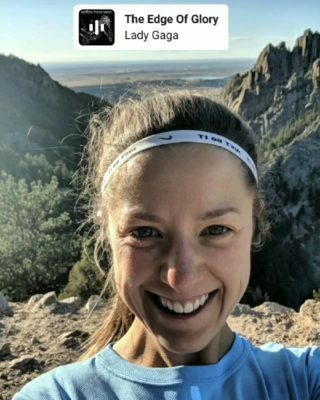 “The Edge of Glory” was my biggest pump up song when I ran my 100th marathon five years ago, and it felt very fitting that it came on while I was standing on a cliff overlooking Boulder. Here’s that same beautiful view without my head in the way. I just love this downhill stretch! I felt fabulous flying down that hill, and after I got to my car and stopped my Strava, I discovered that not only had I clocked my second fastest ever half mile split (2:49), I also set a female course record on that segment. Victory was mine! …but would victory be mine that night? I made the drive home on a total runners’ high, feeling confident that it would. I got home, showered, and then immediately got to work party prepping. I had taken a vacation day, so I only had a few work calls and was able to just get things done, which was great. I had more than 80 people say they were coming over for my Election Night party, so that was a lot of food to prep! My menu was simple and all-American though: two kinds of chili (Pinch of Yum’s sweet potato chili and my award-winning bacon-turkey-tequila chili), plenty of pizza, chips / veggies and three kinds of dip (salsa, spinach yogurt dip, and buffalo blue cheese dip), a big sheet cake, my mom’s incredible oatmeal chocolate chip cookies, and some black-bean brownies. I tried to make the menu half healthy, half indulgent, since I knew I’d be nervously munching away quite a bit! And of course, tons of drinks – though I also knew I wouldn’t be having a drink until after the first set of results came out. In between dashing between the kitchen and the grocery, I finished filling out my own ballot and took it over to Town Hall. It was crazy to think that all these people in line might potentially be voting for me! I was really careful not to say anything to anyone while I was there, though, since I didn’t want to be seen as violating any rules about campaigning around polling places. Meanwhile, I was fielding tons of texts, emails, and Facebook messages from people all day saying good luck and they voted for me. The excitement was building! 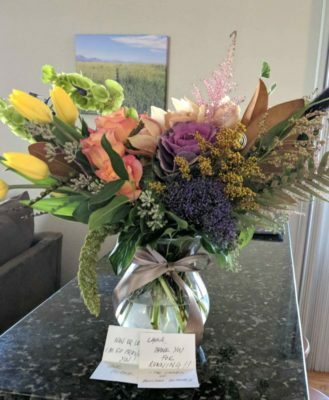 I also got a beautiful bouquet of flowers from one of my friends in New York… and they came with not just a note from her, but also one from the florist, saying she and all the ladies at Boulder Blooms were cheering for me! When I called Blake to thank her, she told me that when she ordered the flowers, the florist was excited that they were for me and my campaign. That made me feel amazing!! After a final few errands, I headed home to finish party prep. My mom was just finishing up the chocolate chip cookies, and I snagged one for myself when I realized I had neglected to eat anything for lunch. Whoops! Guess I really better not touch a drink until after the results, or I’d be tipsy immediately :) As far as my own cooking, while I was a little worried about time, the dips came together quickly, and it didn’t take me too long to cut up the veggies. Finally, at 5pm, my friend Chris texted me that she was too nervous to wait any longer, so she was coming over now with her family. Party time! 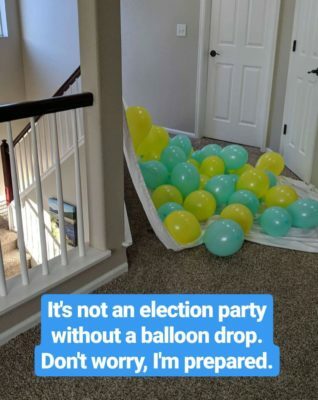 Time to get the balloon drop prepped! 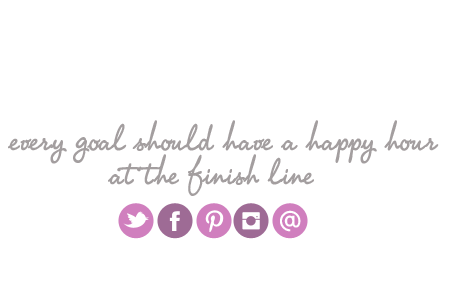 I still wasn’t quite ready with putting everything out – something I always forget when I’m party planning. Things like a cheese tray or veggie platter don’t take any actual cooking, but I always forget how long it takes to put everything out and arrange it nicely, so I was doing a little bit of running around like a chicken with my head cut off as Chris and her family, and other guests, arrived. That wasn’t a bad thing, though. While I knew the last few hours before results would be nerve-wracking, 5:30pm to 6:30pm had a pretty steady stream of guests arriving, so I was kept busy greeting people and pointing them toward the food and drinks. That worked out well! But as 7pm drew closer, I started getting really nervous. At 7pm, the polls would close and the first set of results would be released, with about 1/3 to 1/2 the votes counted. 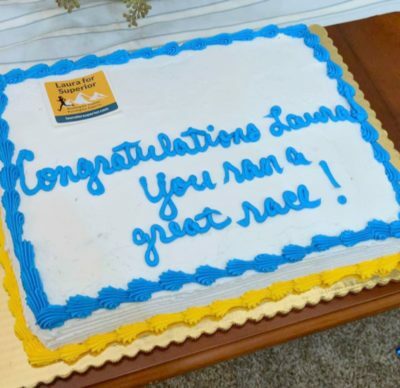 Word on the street was that for Town Trustees, the standings on that first release would typically hold throughout the rest of the counts, unless it was an unusually close race – so as long as I was in first or second when the results came out, it should be a lock; if I was in third or fourth, I’d have to keep checking. It kind of made sense – there was nothing to indicate that early voters would have a different profile than those who vote day of. But I truly had no idea where I was going to fall in the results. For the last few weeks, I’ve had a lot of people telling me that I was their top choice. Which felt great! But by definition, the people telling me that were those I knew – so there could be thousands of others voting for other candidates and not knowing who I was (or worse, hating me). My friend Chris tried to assuage my fears by telling me every time someone I didn’t know told her they were voting for me, but I still had no clue how this was going to go. Those last 30 minutes were tough – and at 6:50pm, I finally poured a glass of champagne for myself and took a small sip. I wanted it in hand for the celebration when I won, and knew that with results coming soon, I’d be okay to drink it anytime now, but I was so nervous that I ended up not really touching any of it after that first sip. In preparation for the results, we hustled everyone from the kitchen / living room into the formal living room / dining room, and I prepared to make a quick impromptu speech. My friend Heather started live streaming using my phone when I started speaking… but I forgot to download it from Instagram Stories before the 24 hours were up. Probably not a bad thing, as my speech was pretty terrible, haha! I meant to write something up I could read, but ran out of time and just made some off-the-cuff remarks instead. I was literally trembling with nerves, and could barely articulate my thoughts. Namely, I just wanted everyone to know how extremely grateful I was for their support. Looking around, I couldn’t believe that my house was full of so many amazing people – some I had known for years, and others I had just met throughout the course of my campaign. And yet, some of those who I just met were my biggest supporters! Win or lose, this campaign was absolutely worth it just to get to meet so many amazing people. My remarks ended with about a minute to go, and my friend (and current Town Trustee) Mark started refreshing his tablet like crazy as the rest of us stood there in anticipation. When he finally said the results were up, even though I was blocked from seeing the screen by his back, I covered my face with my hand. This was it… and before I could even process that this was the moment of truth, he yelled, “Laura’s got it! !” and the room erupted in chaos. I was completely shell-shocked that just like that, the results were out. But a tiny part of my brain wondered what exactly “Laura’s got it” meant. Was Mark just being optimistic, and I was in third place with a chance at being overtaken when the rest of the results came in? (That was honestly what I thought he might mean, which shows you how I had no idea what would happen.) I immediately went over to try to make sense of the results myself, and in fact, I found out that I was in absolute first place, even over the guy who had been leading up one of the Town Committees for years!! Third place was a full 29% behind me, and the last two candidates were in a dead tie and had only half the votes I did! I truly did “got it”! The cheering began, as the balloons I had prepared (but totally forgotten about) dropped from the ceiling. And suddenly confetti was also flying everywhere! I later learned my friend Chris had handed out poppers to everyone, unbeknownst to me. Meanwhile, I was just in total disbelief that this was really happening. Looking all the way back, I remember when our current Trustees started encouraging me to run for office, and I thought there was no way someone like me could do something like that. I’ve never been involved in politics, I had no idea what I was doing with my campaign, and I only lived in Colorado for four years before I ran. I was truly a newbie, but somehow, I had gotten the support of my community and convinced them I was the right person for the job! The celebration continued for a few more hours, and after an interview with the Boulder Daily Camera, but now, I could relax and be happy – and finally have that drink. I didn’t end up having nearly as much champagne as I expected, but it felt wonderful to toast with friends and neighbors – more of whom kept arriving throughout the night. I got congratulatory texts and messages from numerous friends, and even one from our Mayor, who was re-elected by a landslide, and invited me to come join him for a drink at his victory party. While I didn’t want to leave my own party, when the final guests left, I decided we’d move my party over to his place. It was midnight by the time I headed to Brunelleschi’s, and while all the results after the 7pm were pretty delayed (they were supposed to come out every 2 hours), each set that had been released only further confirmed my lead. It felt amazing to sit at the bar with friends and strangers alike, and celebrate. There were a few people there whose names I knew but who I hadn’t gotten to meet yet – and even though they hadn’t met me before, they told me they voted for me and were so happy for my win! By the time I went to bed around 2:30am (so excited I couldn’t sleep, though I had planned to go to bed long before the 1am results), I had a 62% lead over fourth place, and felt reasonably confident that gap wouldn’t be made up. A week later, the votes have almost all been counted (though not yet certified), and I’ve gotten the most votes a Trustee candidate has ever received, including those who ran the same year as presidential elections when turnout is much higher. I can’t believe it!! It’s now been more than a week since Election Day, and I’m finally feeling like the dust is starting to settle and that this is really, truly happening. (Meanwhile, literal radioactive dust is spinning up… more on that in my weekend recap.) One thing I keep thinking about is the book I read toward the end of my campaign, Run for Something. The book emphasizes over and over again that running for office, especially local office, is totally doable – and while I kind of doubted it at the time, now that I’ve successfully done it myself, I concur. This campaign had me experiencing all the emotions – from the jubilance of Election Night to the Saturday morning I cried for hours after some sexist nastiness – but at the same time, it was one of the most incredible experiences I’ve ever had. If my campaign has taught me anything, it’s that you can throw away everything you think you know about politicians and the prerequisites to become one; people are happy to vote for smart, thoughtful candidates, who haven’t done this before but are willing to listen and put in the effort to do the right thing. If I can do this, anyone can do this – it just takes a lot of hard work and dedication. Cheers to four years as Town Trustee!